DAVID LE/Staff photo. 3/7/15. 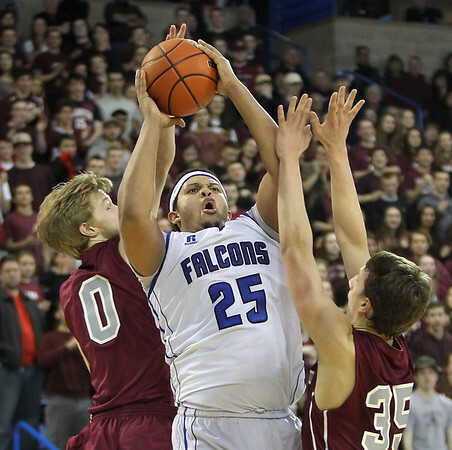 Danvers senior captain Devan Harris (25) splits Arlington seniors Gabriel Adams-Kean (0) and Matthew Moroney (35) and sinks the go-ahead bucket in the second half of the D2 North Championship on Saturday afternoon at the Tsongas Center in Lowell. The Falcons defeated Arlington 50-47 to capture the D2 North Championship.